Bangladesh Prime Minister Sheikh Hasina has been announced as one of the winners of the United Nations Champions of the Earth award in recognition of her country’s initiatives to address climate change. “Serving as Prime Minister of Bangladesh – one of the world’s least-developed countries – Sheikh Hasina has proven that investing in climate change is conducive to achieving social and economic development,” said the announcement issued by the UN Environment Programme (UNEP), which confers the awards. 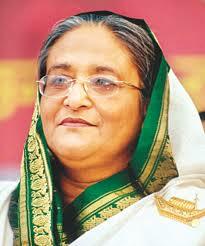 Bangladesh is first developing country to have a Climate Change Strategy and Action Plan which was prepared in 2009. It is also the first country to set up its own Climate Change Trust Fund which is supported by nearly 300 million US dollars from 2009-2012. In 2011, Bangladesh’s Constitution was amended in order to include a constitutional directive to the State to protect the environment and natural resources for current and future generations. Being serving Prime Minister of Bangladesh, Sheikh Hasina has demonstrated leadership and vision in both making climate change an issue of national priority and advocating for an ambitious global response.